Uppu Seedai is a Traditional Indian snack we used to during festival time. It is a crispy ball like snack. Kids will like this snack very much for its taste and also for its shape. 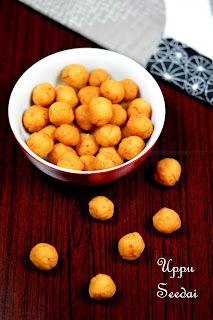 I haven't tried this snack for long time..until one of my friend Anu asked me for the recipe. As her doubt was... how can we do without busting ? This make me to do trial on Seedai recipe. I want to share this with you.. And hope it will be useful for u to do without fear!